Dr. James Willingham | Reaching New Heights Foundation Inc.
Mr. Willingham and his family moved to Ontario, Ca from Los Angeles, and Ca in 1986. The younger of his two children began attending Creekview Elementary School and subsequently attended schools in the Mountain View School District and Ontario High School. In 1992 Mr. Willingham was awarded the Honorary Service award by the Creekview Parent Teachers Association, for exceptional service to children. He is a graduate of California State University Dominguez Hills, University of Phoenix and California Coast University where he received his Doctors Degree in Business Administration. Mr. Willingham‘s community involvement includes several years of service with AYSO in various positions. 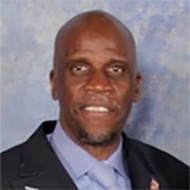 For the last seven years Mr. Willingham currently serves as a Commissioner, Chairman/Vice Chairman of the San Bernardino County, Equal Employment Opportunity Commission, whose mission is to ensure diversity in county employment. Additionally Mr. Willingham has served as a current Commissioner Chairman/Vice Chairman of the San Bernardino County, Veterans Advisory Council, addressing the needs of Veterans in San Bernardino County. Mr. Willingham is a Vietnam Era Veteran and was honorably discharged from the United States Marine Corps in 1973. In 1994 Mr. Willingham retired from the federal government after serving twenty nine years in various investigative and law enforcement positions. In Nov 2012, Mr. Willingham was elected to the Mountain View District, Ontario, Ca Board of Trustees and serves as a School Board Member and Community Leader. In Dec 2012 Mr. Willingham retired from the State of California after twelve years of employment with the Employment Development Department, as a Veterans Employment Services Specialist.